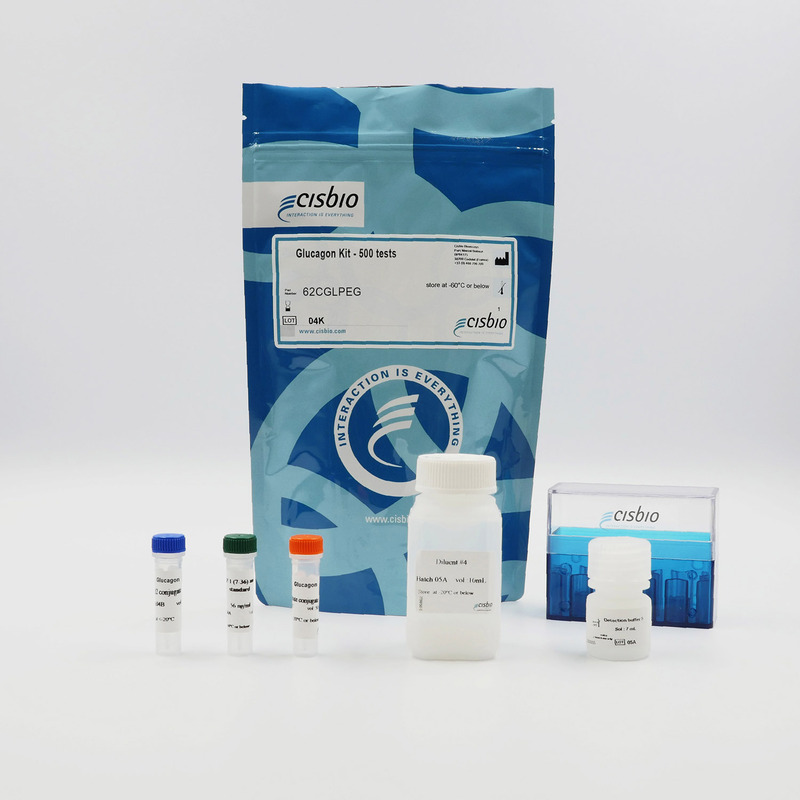 The Glucagon kit is intended to provide significant time-saving over ELISA, in the quantification of glucagon in cell culture media. The Glucagon assay offers superior sensitivity and ease-of-use for a reliable quantification of glucagon in cell culture media. Built on a truly homogeneous protocol, the assay does not require any washing or complex extraction steps, meaning significant time savings over ELISA methods. Simply add the detection reagents, incubate, and read! Glucagon is measured using a sandwich immunoassay with two monoclonal antibodies, one labelled with Lumi4-Tb Cryptate (donor) and the other with d2 (acceptor). The intensity of the FRET signal obtained is proportional to the concentration of glucagon in the sample. Typical calibration curves obtained by the dilution of glucagon standard in cell-culture media conditions for 20 µL final, using a white 384-well small volume plate, are presented below. Samples were incubated overnight at RT and diluted in diluent #5. The assay ranges from 15,6 to 2000 pg/mL and the detection limit measured was 6 pg/mL (PHERAstar FS reader - flash lamp excitation). Dilution linearity in cell culture media was assessed. Recovery results of between 88% and 100% were obtained, supporting the claims regarding linearity. Mouse a-TC1-6 cells were seeded in 96-well culture treated plates (100k cells/well) in complete culture medium containing 25mM glucose and incubated for 24 h at 37°C - 5% CO2. The media was then removed and the wells washed twice with KRB buffer before being incubated 1 h with KRB buffer containing low glucose (1 mM). Supernatants were collected and serially diluted in diluent #5. Results are expressed as percent observed from expected. Intra-assay and inter-assay variability in cell culture media conditions were assessed. Typical CVs of less than 5% were obtained, supporting the features required for a robust and reproducible assay. 15 pancreatic islets isolated from a C57BL/6J mouse were exposed to increasing concentrations of Glucose or Adrenaline. Following exposure, supernatants were collected and their Glucagon levels quantified. In the presence of glucose, Glucagon levels were readily detected using as few as 15 islets per well. All results were similar to those previously published by other investigators. Courtesy of Physiopathology of pancreatic BETA cell research team, Institute de Génomique Fonctionnelle, Montpellier, France.